My cousin was 5 years old when we got married 18 years ago. She was an adorable flower girl in our wedding. Most of our lives we have lived a few states away from each other, but when we moved up to the Seattle area, I got to know her a little bit better. She no longer lives nearby, but I think and pray for her often. It’s usually on the days when I’m really lonely and struggling with the long hours of a chef that I think of her and pray for her. Her husband is not a chef (although he cooks very well), but is deployed in the Army. So while I sit at home, lonely and depressed about my husband who is working long hours an hour away from our house, I am reminded of her and many others, who have husbands on the other side of the world who will not be home for months. That kind of puts a different perspective on my feelings at the moment. Yes, there are many days and nights that I am lonely. But I could always get in the car and drive an hour (which seems like an ETERNITY with our 3 kids) and see my chef/husband. He would stop what he was doing and say hello and make sure we were OK.
She can’t just hop in the car when she is lonely. Every time I think of her I pray for her. I pray that God will supply all her needs while her husband is away and when he returns (Philippians 4:19). I pray that she will find friends who will be as close as family that she can hang out with and celebrate with on holidays. I pray for peace and comfort for her as I imagine she often worries about her husband’s safety (Philippians 4:6). I’m sure it’s REALLY tough! And just like many people can’t really know what it’s like to be married to a chef because they haven’t lived it, I can’t truly understand the loneliness she must feel having a husband deployed on the other side of the world and living so far away from family. I haven’t lived it. All of a sudden my husband’s long hours don’t seem quite as bad. Don’t get me wrong. The hours still stink. I still wish he could be home more. I’m still lonely, even with 3 very talkative kids around. But he’s only an hour away. Thinking of my cousin and her husband helps me think a bit differently each time I start to have a little pity party for myself. An hour away is nothing compared to the other side of the globe. Even though my husband will be home at O Dark Hundred tonight after working 15+ hours, he will still come home and crawl into bed next to me (Lord willing). For the most part, I do not worry about his safety (except the occasional night when he is really late and I wake up in a panic, remembering the night he fell asleep on the way home from work and broke his back.) My little pity party should probably stop or at least greatly diminish. So to my sweet cousin, please know that I think and pray for you often, even though I don’t write, call or message you on Facebook very often. I know you are not alone as a military wife, just as I am not alone as a chef’s wife. Thank you for the sacrifices that both you and your husband make for our country. I’m sorry that so many of us in this country take both of you and our freedom for granted. While I can not imagine what both you and your husband go through on a daily basis being so for apart, thank you for enduring it all. Please know that you are not alone. Now I know that many of you reading are not married to a chef, but to someone in another profession who also works long hours. I’ve heard from many of you and know you get what I’m saying. It somehow helps knowing we are not the only ones feeling lonely because of long hours our spouses or significant others work. If you follow this blog and can relate to it in some way, would you mind dropping me a short comment below telling me why? Something like, “I’m married to a police officer. I’m married to a chef. I just recently lost my Mother. My boyfriend is a line cook. My Dad was a chef.” Whatever the case may be. Nothing real specific. Just a brief note. I would just love to know who can relate to this blog and why. It will only take a minute. Thank you for following along with me as I write. Married to a chef, we have 2 kids (6&8) and sometimes just need the encouragement that I’m not the only one dealing with this and I can do it 🙂 Thank you for taking the time to post. It really does help! We can do it! There’s a lot of us out there working hard every day! Thanks Meagan. Hi, I relate because my husband is a restaurant manager. He works 12-16 hour days and is exhausted the rest of the time. I have also checked myself by thinking of military spouses. However, in a way I think it’s different because you wouldn’t expect and then not get help or company. For me it’s a lot of unfulfilled promises and expectations. Serena, that’s a good point. It’s so hard when you are expecting them to be there for something but then they need to go into work. It’s disappointing. Explaining it to the kids is tough too. Thanks for mentioning that. Those hours are so hard, especially on our kids! 🙁 The hours and hard work can pay off as they move their way up in the kitchen. It just takes a long time. 🙁 Hope you are able to find a little time this Christmas season to celebrate together!! Thank you for sharing your family’s life with us, and how to deal with many common issues as a partner of a chef… I recently started dating a sous chef, and my ex was a line cook. I’ve been reading a lot of your blog posts and they’re really insightful and encouraging, even if I can’t relate to 100% of it. I actually like your blog much better than the other chef wives’ blogs, because your writing tone is realistic, but still gentle. Most advice available online, on this topic, are written for women whose partners lived like… two states away. Not that those situations are easy either, but it is so rare (for me) to come across empathy that was actually relevant to my international, long distance, relationships… and time zone differences were 12 – 14 hours, often an entire day ahead. I agree with you on having respect and admiration for military wives/girlfriends, I think their struggles are difficult and unique; there are huge risks that just don’t apply to other jobs, and there needs to be more compassion and awareness for them (and I’m not even an American). I was quite upset at my sous chef/boyfriend a few weeks ago, because he changed jobs/restaurants, and they hadn’t fixed his schedule. We exchanged maybe 8 texts total, over 6 days. I tried to be understanding, but it was hard when I didn’t even know when was the next time I was going to see him… and it felt like I was in a long distance relationship again (that I did not ask for). We had a good talk, and we are much better at communicating now. But it really sucked to try to talk to my friends about this, because no one understood… in fact, many of them have been very unsupportive. My best friend told me to break up with him because “he can’t juggle work and you; he’s the problem.” and I was horrified that she would suggest such a thing. I am really proud of my boyfriend, and there are a multitude of reasons why I wouldn’t trade him for anyone… So it is really comforting to know there are others out there like you, who have even gone before me, so to speak, and that our feelings are legitimate and valid. I also agree with Katie’s comment above, I am mentally preparing for the lifestyle to get “that much harder,” if my sous chef/boyfriend becomes more successful. But I will keep reading your blog, and find ways to make it work. Thank you for writing and sharing your wisdom with all of us. Sending cyber hugs to you and your beautiful family! Sounds like you are far apart right now. 🙁 Glad you found me! Feel free to come chat with us more over in our closed Facebook group. 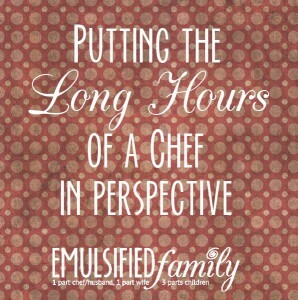 Details here if you are interested – http://emulsifiedfamily.simpleseasonallocal.com/support-group-for-chef-wives-and-significant-others/.